I attempted rice again in the solar cooker. The first time it came out so yummy and fluffy that I was excited to do it again. So excited, in fact, that I left the rice out there for almost 2 hours. It was…crunchy. I guess I should add rice to the list of things where time matters. However, my recipe called for mango pieces mixed with the rice, so it moistened it right back up. This recipe comes from the China Study Cookbook. Cook the rice. Cut the mango and stir it into the rice. 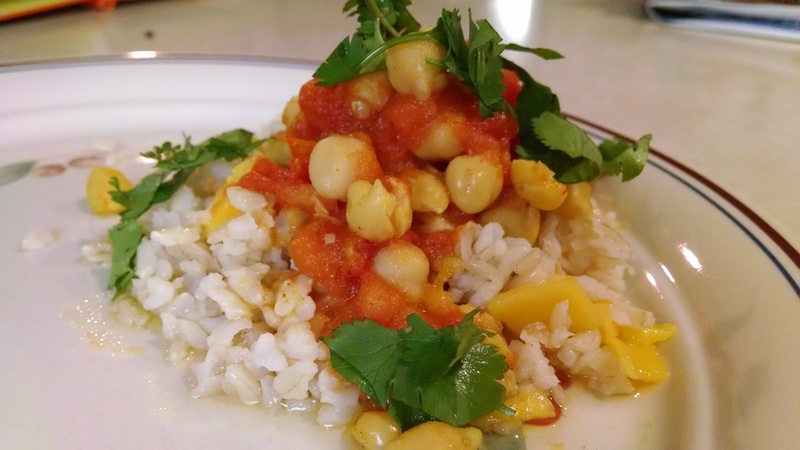 In a saucepan, combine diced tomatoes, chickpeas, and curry. Simmer 4 minutes. Serve with the tomato mixture spooned on top of the rice. Garnish with cilantro.